GoAir reported the best on-time performance in the month of November 2018. The domestic airlines flew 1.16 crore passengers in November registering a year on year growth of 11.5 per cent over the 1.04 crore passengers flown by the industry in the same period last year. The latest data released by the Directorate-General of Civil Aviation (DGCA) show that IndiGo topped the list with 50.06 lakh passengers. Jet Airways took the second position carrying 14.87 lakh passengers while SpiceJet carried 14.55 lakh passengers giving it the third spot. 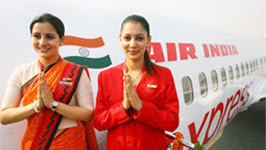 Air India flew 14.18 lakh passengers, GoAir (10.19 lakh), AirAsia (6.18 lakh), Vistara (4.15 lakh) and JetLite (1.75 lakh) during November. SpiceJet reported the highest Passenger Load Factor (PLF) among all domestic carriers at 91.1 per cent followed by GoAir (87.6 per cent), AirAsia (86.5 per cent) and IndiGo (84.9 per cent). Passenger load factor shows how many of the total seats on offer by each airline are getting filled. GoAir reported the best on-time performance (OTP) at 87 per cent at the four metro airports — Delhi, Mumbai, Hyderabad and Bengaluru. Vistara at 86.1 per cent took the second position followed by IndiGo (79.2 per cent). Jet Airways, Jet Lite (76.6 per cent) and Air India reported an OTP of 64 per cent at the four airports. The industry paid over ₹3.34 crore to the over 1.44 lakh passengers affected by cancellations, delays and those who were denied boarding in November this year. This includes paying over ₹1.5 crore to over 2,600 passengers from among the 1 lakh who were denied boarding. The industry also paid over ₹1.27 crore to over 1.15 lakh passengers affected by delays. "Fall in oil prices and holiday sales by airlines will ensure stable airfares and will continue to shoulder the passenger traffic growth in the month of December,” said Aloke Bajpai, Chief Executive Officer and Co-founder ixigo.